Though nine out of ten Americans perceive blue-collar jobs as “good jobs” and policymakers tout the benefits of expanding the country’s manufacturing base, the truth is that factory wages now rank in the bottom half of those for all jobs in the U.S., according to a new study from the National Employment Law Project (NELP). But “while the manufacturing sector has been resurging in the last few years, growing by 4.3 percent between 2010 and 2012, the jobs that are returning are not the ones that were lost: wages are lower, the jobs are increasingly temporary, and the promised benefits have yet to be realized,” they write. In the largest segment of the manufacturing base—automotive—wages have declined even faster. Real wages for auto parts workers, who now account for three of every four autoworker jobs, fell by nearly 14 percent from 2003 to 2013—three times faster than for manufacturing as a whole, and nine times faster than the decline for all occupations. In particular, new jobs in the auto industry pay less than the jobs that were lost. New hires in auto earn less than $10 an hour. Heavy reliance on temporary workers hides even bigger declines in manufacturing wages. About 14 percent of auto parts workers are employed by staffing agencies today. Wages for these workers are lower than for direct-hire parts workers and are not included in the official industry-specific wage data cited above. Writing at the Campaign for America’s Future blog, Dave Johnson blames globalization and so-called free-trade pacts for exacerbating—if not directly causing—the issues raised in NELP’s report. “American factory jobs used to provide reasonable pay and benefits—largely because of unions and democracy. So how do you make manufacturing jobs more ‘efficient?’ You can move the factory to a country that doesn’t allow unions. Our country used to recognize this game and ‘protected’ the good wages and benefits that democracy provided people with tariffs that raised to price of goods made in places that allowed exploitation of working people. Solution: ‘free trade’ that pits our democracy against thugocracies with few or no protections for people or the environment. Free trade’ worked—to force unemployment up and wages down. We lost more than 6 million manufacturing jobs and 60,000-plus factories between 2000 (the year before China entered the World Trade Organization) and 2010. With approval of the corporate-friendly Trans-Pacific Partnership on the horizon, NELP’s findings are a wake-up call, writes Scott Martelle for the LA Times. “We as a nation need to press the federal government to rethink trade policies, especially as it pushes for ever more deals to make it easier to ship goods and jobs around the world,” he says. “The looming Trans-Pacific Partnership (look at it as NAFTA for the Pacific Rim) might be good for global manufacturers and American consumers, but those consumers are also American workers. Driving down retail prices while also driving down family incomes is the wrong spiral for community stability and a steady or improving standard of living. The war over Ukraine will essentially run along the lines of a full-scale military offensive against the southeast Donbas region, targeting the breakaway ethnic Ukraine- Russian Peoples Republic of Donetsk and Lugansk, with the intention of deposing the democratically elected government, disarming the popular militias, killing the guerrilla resistance partisans and their mass base, dismantling the popular representative organizations and engaging in ethnic cleansing of millions of bilingual Ukraino-Russian citizens. NATO’s forthcoming military seizure of the Donbas region is a continuation and extension of its original violent putsch in Kiev, which overthrew an elected Ukrainian government in February 2014. The official drum- beat for a widening conflict in Ukraine, spearheaded by the Kiev junta and its fascist militias, echoes in every Western mass media outlet, every day. Major mass media propaganda mills and government ‘spokesmen and women’ publish or announce new trumped-up accounts of growing Russian military threats to its neighbors and cross-border invasions into Ukraine. New Russian incursions are ‘reported’ from the Nordic borders and Baltic states to the Caucusus. The Swedish regime creates a new level of hysteria over a mysterious “Russian” submarine off the coast of Stockholm, which it never identifies or locates – let alone confirms the ‘sighting’ of. Estonia and Latvia claim Russian warplanes violated their air space without confirmation. Poland expels Russian “spies” without proof or witnesses. Provocative full-scale joint NATO-client state military exercises are taking place along Russia’s frontiers in the Baltic States, Poland, Romania and Ukraine. The Kiev regime has never abided by the Minsk cease fire. According to the UN Human Rights office 13 people on average –mostly civilians –have been killed each day since the September cease fire. In eight weeks, the UN reports that 957 people have been killed –overwhelmingly by Kiev’s armed forces. Each and every escalation of economic sanctions against Russia is designed to weaken the capacity of the Donbas resistance fighters to defend their homes, towns and cities. Each and every Russian shipment of essential medical supplies and food to the besieged population evokes a new and more hysterical outburst – because it counters the Kiev-NATO strategy of starving the partisans and their mass base into submission or provoking their flight to safety across the Russian border. After suffering a series of defeats, the Kiev regime and its NATO strategists decided to sign a ‘peace protocol’, the so-called Minsk agreement, to halt the advance of the Donbas resistance into the southern regions and to protect Kiev’s soldiers and militias holed-up in isolated pockets in the East. The Minsk agreement was designed to allow the Kiev junta to build up its military, re-organize its command and incorporate the disparate Nazi militias into its overall military forces in preparation for a ‘final offensive’. Kiev’s military build-up on the inside and NATO’s escalation of sanctions against Russia on the outside would be two sides of the same strategy: the success of a frontal attack on the democratic resistance of the Donbas basin depends on minimizing Russian military support through international sanctions. The Israeli authorities restored the previous life sentences issued against two Palestinian prisoners who had been released as a part of the Shalit deal, Felesteen Online news reported on Friday. One prisoner is from Tulkarem and the other Nablus, in the occupied West Bank. According to Felesteen Online, the director of the Ahrar Centre for Prisoners Studies and Human Rights, Fuad Al-Khafsh, announced that the Israeli authorities had re-issued the life sentences on the two released prisoners, Ashraf Al-Wawi from Tulkarem and Hamza Abu Arkoub from Nablus. Since tensions started escalating in the occupied Palestinian territories last summer, the occupation authorities have detained thousands of Palestinians, including re-arresting dozens of former prisoners released as part of the Shalit exchange deal in 2011. Six British journalists have filed a lawsuit against the Scotland Yard after documents showed that the police in London were spying on them for more than a decade. The lawsuit, which was filed by the National Union of Journalists against London’s Metropolitan Police and the Home Office, was announced late Thursday. The group of journalists, including three photographers, an investigative journalist, a newspaper reporter and a freelance video journalist, took legal action after they discovered the Metropolitan Police had been recording their professional activities on a secret database. The database was reportedly designed to monitor so-called domestic extremists. The records included the movements of the journalists while working, their appearance and how they used a camera to record the events they were covering. The journalists said the lawsuit is aimed at exposing the persistent pattern of journalists being assaulted, monitored and stopped and searched by police during their work. The group is also seeking to force the police to destroy the files containing records of their activities, saying the surveillance violates the liberty of the press and their privacy. Both the Metropolitan police and the Home Office have declined to comment on the legal action. The lawsuit comes as recent public disclosures of police records have revealed that Scotland Yard secretly seized journalists’ telephone records. Several senior police officers have acknowledged keeping an eye on journalists by using powers granted under anti-terrorism measures. A previous lawsuit by five journalists resulted in the police apologizing or paying damages for wrongdoing, including assault and unjustifiable searches while they were working. The irony of the resolution is that the measure was initially drafted by Canada which has, itself, a disgraceful history of human rights abuse against the aborigines in the country. Further to that, Ottawa has constantly and vehemently thrown its full-throated support behind Tel Aviv in its inconceivably ruthless crimes against the people of Palestine. Over the past three decades, the MKO has initiated a series of deadly attacks on Iran and the Iranian population and has so far assassinated 12,000 Iranians including nuclear scientists. It is interesting to note that the assassinations of prominent Iranian characters including the politicians and scientists are basically conducted in cahoots with Israeli Kidon, the assassination unit within Mossad. Viewed from an entirely different angle, the measure very bizarrely coincides with the nuclear talks between Iran and the world six world powers and the November 24 deadline. So, the move may be seen as a last-ditch effort by pro-Israeli lobbies to proceed with their scenario of Iranophobia on the one hand and to sabotage the nuclear talks and bring them to a standstill on the other hand. The UN consciously or unconsciously plays into the hands of the pro-Israeli pressure groups in Canada and only puts on an ugly show of duplicity in imposing a ruling against the Islamic Republic. Eric Chester’s new book, The Wobblies in their Heyday: The Rise and Destruction of the Industrial Workers of the World during the World War I Era, fills this gap. It is indispensable reading for Wobblies and labor historians. One way to summarize what is between these covers is to say that Chester spells out three tragic mistakes made by the old IWW that the reinvented organization must do its best to avoid. Labor organizing flourished during World War I because of the government’s need for a variety of raw materials. Among these were food, timber, and copper. Wobbly organizers made dramatic headway in all three industries. At its peak in August 1917 the IWW had a membership of more than 150,000. This sad state of affairs was, of course, partly the result of a calculated decision by the federal government to destroy the IWW. But only partly. For years, Wobbly leaders had insisted that sabotage could force employers to make concessions, Chester writes. But what Chester terms “nebulous calls for arson” and “macho bravado” only stiffened the determination of California authorities not to modify jail sentences for Wobbly leaders Ford and Suhr. Chester finds that there is no credible evidence that any fields were, in fact, burned. But after the United States entered World War I in April 1917, this extravagant rhetoric calling for the destruction of crops apparently helped to convince President Wilson to initiate a systematic and coordinated campaign to suppress the Wobblies. International solidarity and militant opposition to war and the draft were central tenets of the IWW. Wobblies who had enrolled in the British Army were expelled from the union. At the union’s tenth general convention in November 2015, the delegates adopted a resolution calling for a “General Strike in all industries” should the United States enter the war. What actually happened was that general secretary-treasurer Bill Haywood and a majority of IWW leaders agreed that the union should desist from any discussion of the war or the draft, in the vain hope that this policy would persuade the federal government to refrain from targeting the union for repression. At the same time, the great majority of rank-and-file members, with support of a few leaders such as Frank Little, insisted that the IWW should be at the forefront of the opposition to the war. Self-evidently, what Chester terms the IWW’s “diffidence” was the very opposite of Eugene Debs’ defiant opposition to the war. When Wobbly activists “flooded IWW offices with requests for help and pleas for a collective response to the draft,” the usual response was that what to do was up to each individual member. Haywood, Chester writes, “consistently sought to steer the union away from any involvement in the draft resistance movement.” Debs notwithstanding, however, the national leadership of the Socialist Party like the national leadership of the IWW “scrambled to avoid any confrontation with federal authorities.” Radical activists from both organizations formed ad hoc alliances cutting across organizational boundaries. The reluctance of the Wobbly leadership to advocate resistance to the war and conscription carried over to a legalistic response when the government indicted IWW leaders. Haywood urged all those named in the indictment to surrender voluntarily and to waive any objection to being extradited to Chicago. In the mass trial that followed, the defendants were represented by a very good trial lawyer who was also an enthusiastic supporter of the war and passed up the opportunity to make a closing statement to the jury. Judge Landis’ superficial fairness deluded Wobs into hoping for a good outcome. The jury took less than an hour to find all one hundred defendants guilty of all counts in the indictment. Ninety-three received lengthy prison terms. Judge Landis ordered that they be imprisoned in Leavenworth, described by Chester as “a maximum-security penitentiary designed for hardened, violent criminals.” Forty-six more defendants were found guilty after another mass conspiracy trial in Sacramento. Thereafter, Chester writes, the “process of granting a commutation of sentence was manipulated during the administration of Warren Harding to divide and demoralize IWW prisoners.” The ultimate result was “the disastrous split of 1924, leaving the union a shell of what it had been only seven years earlier.” Executive clemency, like that granted to Debs, was the only hope of the Wobblies in prison for release before the end of their long sentences. President Harding rejected any thought of a general amnesty, obliging each prisoner to fill out the form requesting amnesty as an individual. The application form for amnesty contained an implicit admission of guilt. The newly-created ACLU supported this process. Initially, the IWW supported those prisoners who refused to seek their freedom individually. Those who had submitted personal requests for presidential clemency were expelled from the union. In June 1923, the government once again dangled before desperate men the prospect of release, now available for those individual prisoners promising to remain “law-abiding and loyal to the Government.” This time a substantial majority of the remaining prisoners accepted Harding’s offer, and IWW headquarters, in what Chester calls “a sweeping reversal,” gave its approval. Eleven men at Leavenworth declined this latest government inducement. In addition, those who were tried in California did not receive the same offer. It is not the intent of brother Chester’s book, or of this review, to trash the IWW. This review has dealt with only about half of the material in the book, for example passing by the story of Wobbly organizing in copper, both at Butte, Montana and Bisbee, Arizona. Moreover, any one who lived through the disintegration of SDS, SNCC and the Black Panthers is familiar with tragedies like those described here. The heroism of members of all three groups who were martyrs, such as Frank Little, Fred Hampton, and the Mississippi Three (Chaney, Goodman, and Schwerner), remains. The vision of a qualitatively different society, as the Zapatistas say “un otro mundo,” remains also. Staughton Lynd is an American conscientious objector, Quaker, peace activist and civil rights activist, tax resister, historian, professor, author and lawyer. Staughton Lynd’s most recent book is From Here to There: the Staughton Lynd Reader. Four years ago, the developer of a proposed Wal-Mart supercenter in Florissant, Mo. (pop. 52,000) appeared before city leaders. For decades Wal-Mart had wanted to open a supercenter in my hometown and on this particular Monday evening a representative from THF Realty – Wal-Mart’s longtime developer of choice – was alternately putting on the poor mouth and subtly threatening city officials. In order to fund the development, a project developer told the city council, THF Realty would require $9 million in tax breaks. No tax breaks, no Wal-Mart. In brief, THF wanted a TIF – tax incremental financing, which meant the portion of the development’s property tax revenue that ordinarily would go to local schools, police, libraries and fire departments, instead would remain in the pockets of the developer. Such threats, coming from multibillionaire developers, are commonplace. They are also effective. Though not as effective as they once were. THF Realty (the acronym stands for To Have Fun) owns or leases more than 100 shopping centers in 22 states, many anchored by Wal-Mart stores or Sam’s Club. That’s due in part to THF’s chairman – sports and real estate tycoon Stan Kroenke – being married to Wal-Mart heiress Ann Walton. The last time Kroenke was obligated to disclose his ties with Wal-Mart – when he served on Wal-Mart’s board of directors 13 years ago – his company was renting 55 stores to the giant retailer. Today, Kroenke — the 105th richest American — has an estimated net worth of $5.7 billion. His wife, Ann, is worth an estimated $4.8 billion. Kroenke owns the Denver Nuggets, the Colorado Avalanche, the St. Louis Rams, the Colorado Rapids and, in a sure sign that he is running out of ways to unload his billions, the English soccer club Arsenal. Wal-Mart doesn’t always use outside developers (or inside developers like Kroenke) to build its discount stores and supercenters. “Sometimes Wal-Mart is itself the developer,” says Al Norman, an anti-sprawl consultant. When Wal-Mart purchases and develops a site it utilizes the Walmart Real Estate Business Trust, one of its many subsidiaries. “[But] if Wal-Mart hasn’t bought the land, it’s better for them to put the burden on a developer to get all the permits, ask for the subsidies, and make any land agreement contingent on the developer having all the permits in place,” says Norman. Using outside developers, however, allows Wal-Mart to benefit from government subsidies without being the one making the pitch for the handout. If Wal-Mart hoped to draw attention away from itself by using this tactic in Florissant it failed. For the most part the public regarded the proposed development as a Wal-Mart project and refused to distinguish between Wal-Mart and its developer. And local media played up the connection: “Florissant Council Turns Down Wal-Mart Developer,” cried one headline. In many ways Florissant, Mo., a working class city in North St. Louis County, is no different than most American cities. When it comes to big box shopping centers its philosophy seems to be that a town can never have too many. Florissant’s sprawling main drag, Lindbergh Boulevard, is an unbroken chain of such shopping centers, with only a few acres of unadorned, treeless asphalt parking lot separating them. Each center has a large grocery store chain or a big box retailer (Target, Kmart, Michaels, Sears, Lowes, Home Depot, Office Depot) as its anchor. Nor can it be said that Florissant residents are suffering a dearth of Wal-Marts. There’s a supercenter four-and-a-half miles away in Ferguson (you may recall that it was vandalized during the recent Ferguson riots). Another Wal-Mart waits 13 miles away in Bridgeton. Yet another sits 14 miles down the road in Granite City, Ill. And another 14 miles away in the opposite direction in St. Charles. Fortunately for Wal-Mart and its developers, they do not have to show a need or demonstrate likely economic benefits to the community to receive subsidies and tax breaks. They need only ask and they shall receive. Wal-Mart was no disinterested party in THF’s quest for tax breaks. A TIF could mean big savings for the retailer. “Wal-Mart is in a position to negotiate lower lease rates when the developer is being subsidized,” says Philip Mattera, director of a watchdog group called the Corporate Research Project. Wal-Mart was counting on that subsidy. Then as now the tax break of choice for Wal-Mart and its developers was tax increment financing. TIFs were originally established to encourage developers to invest in hopelessly blighted commercial areas. Blighted soon came to mean non-blighted. Call it subsidy creep. Historically a few school officials and PTA moms groused when these TIFs were granted. Yet in all those countless city council meetings I attended, I never once heard a city official ask why one of the wealthiest corporations in the world couldn’t build its discount stores and parking lots without withholding tax dollars from local schools, fire departments, libraries and other public services. The simple answer was that nobody asked them to. When it came to subsidies and tax breaks Wal-Mart’s motto seemed to be: It doesn’t hurt to ask. All they can do is say no. And then we threaten to move to the next town. Those threats were real. If a town even considered turning down a TIF request, a neighboring jurisdiction would immediately begin courting the Waltons. The practice became so widespread the Missouri legislature was forced to pass a reform law in 2007 to address this type of “retail pilfering.” In Missouri, TIFs are now granted only on a county-wide basis. Now, three decades later, Wal-Mart and its developers find themselves having to work harder to obtain the same subsidies and tax breaks they once received by default. Cities and towns – even municipalities like Florissant, the majority of whose residents really want a Wal-Mart Supercenter – are beginning to stand up to the retail giant and its sidekick THF Realty. Indeed, across the Midwest – Wal-Mart’s home turf – more and more cities are saying they’ve had enough of Wal-Mart’s bullying. When Wal-Mart developers returned to Florissant in 2010 demanding tax breaks and threatening to walk away if they were denied, city officials happily showed developers the door. That response was almost unprecedented outside of a few quaint New England hamlets. In fact, the neighboring city of Bridgeton, had just rubber stamped THF’s request for $8 million in TIF subsidies to build a Wal-Mart supercenter, no questions asked. Even Missouri’s right-wing think tank, The Show-Me Institute, criticized Wal-Mart and Kroenke’s browbeating tactics. “You don’t need TIFs to attract retail development. With the right project and the right location, retail development will still come,” one policy analyst said. First and foremost Americans have just been through the nation’s worst economic slump since The Great Depression. While average working Americans lost their homes and livelihoods, Wal-Mart got richer. Wal-Mart was one of the few stores to thrive during the U.S. recession, noted Forbes in March 2009. What’s more, Americans wised up. In our total information society it is hard to remain deaf to the continual buzz of stories that spotlight the incredible wealth of the retailer (Wal-Mart Inc. is now wealthier than 157 nations.) When another St. Louis County municipality (Shrewsbury) rejected Wal-Mart’s request for a TIF in 2013, an alderwoman was quoted as saying, “The six Wal-Mart heirs alone have more wealth than the bottom 40 percent of the people in the United States!” This statement was met with loud applause. At the same time as its phenomenal growth was taking place, Wal-Mart received hundreds of millions of dollars in corporate welfare (tax breaks, grants, low-cost financing, tax abatements and free land) from state and local governments. A new report by Americans for Tax Fairness concluded that Wal-Mart receives $6.2 billion a year in taxpayer subsidies. In a 2007 report, the nonprofit Good Jobs First noted that Wal-Mart’s developer THF Realty received at least $54 million in tax breaks from local governments for Wal-Mart stores between 1994 and 2006. While Wal-Mart benefits enormously from corporate welfare, it has become adept at dodging local, state and federal taxes. The same report by ATF noted that Wal-Mart uses tax loopholes to avoid paying $1 billion of federal taxes a year. An example of this flimflammery showed up recently in a The Wall Street Journal story which showed how Wal-Mart evades some state taxes by paying rent to itself. Yes, these tax dodges are legal, though they are only available to the world’s richest corporations who can afford to hire the world’s slickest tax attorneys. Equally damaging are the frequent stories that show Wal-Mart stiffing American taxpayers and its non-union employees. Low wages at a typical Wal-Mart Store cost taxpayers about $1 million in government assistance annually, according to a study by Democrats in the U.S. Committee on Education and the Workforce. Meanwhile the media is rife with stories of Wal-Mart employees who can’t afford to shop at Wal-Mart, who are forced to rely on food stamps, and who cannot afford to buy even the crappiest of cars to get to work. In October, Wal-Mart announced it would end health care benefits to a portion of its part-time employees. And who can forget the story about Wal-Mart employees holding Thanksgiving food drives for their co-workers? After receiving an unexpected setback in Florissant, THF Realty redoubled its efforts in the fall of 2012. Plan B was to seek designation as a community improvement district. Missouri’s CID law, passed by the state legislature in 1998, was created to combat “community disinvestment and neighborhood decline” in inner-ring suburbs. (Florissant is an outer-ring suburb, but no matter.) In effect, community improvement districts bring improvements to small pockets of retail, while the rest of the town crumbles. And it is more likely to crumble since residents who are already paying higher sales taxes in these retail pockets will have less taste for a city-wide sales tax which would raise the standard of living for all residents. The special taxing district would have permitted Wal-Mart to assess a one percent sales tax on store transactions. Just another way for Wal-Mart and THF to pass along the costs of construction to the middle and low-income folks who shop at their stores. Needless to say that revenue would not go to increase the wages of Wal-Mart workers. Again, Florissant city leaders stuck to their guns, unanimously voting down the proposed CID. Kroenke, however, still had his ace in the hole. He turned to the courts; not to sue the city of Florissant, but to file a petition in circuit court for the formation of a transportation development district. The Missouri Transportation Development Act was passed by the Missouri Legislature in 1990 to address genuine transportation needs. Say, your town has grown by leaps and bounds and you desperately need a new overpass over the Interstate highway so emergency vehicles can get to the other side of town more quickly and thus save lives. More often, however, a TDD is just another needless handout to billionaire developers. With one rather remarkable difference. Unlike a TIF or CID, the public (or its elected representatives) have no say in the matter. Since St. Louis judges are appointed, the project is approved (TDDs are always approved) by an unelected judge. Taxpayers have no say whether sales taxes are imposed or what happens to their tax dollars or even whether the transportation projects are needed. If approved, the THF’s transportation development district would have allowed a board handpicked by Kroenke to impose a sales tax on shoppers to help pay for roadwork that benefits his private property. What’s more, any money that Kroenke “loaned” to the project would be repaid with interest. If this TDD turned out like Kroenke’s other ventures, it would be overseen by a board made up of his rubber-stamping cronies. A board that meets and operates without any real oversight. “Read state auditors’ reports on special taxing districts, and you’ll see all kinds of reports of shoddy record keeping, self-dealing and much transparency in name only,” reports the Kansas City Business Journal. Once again, working families would pay for Wal-Mart and the billionaire Kroenke’s street improvements through higher sales taxes. At the hearing for what was now called the Shoppes at Cross Keyes Transportation Development District, Florissant’s city attorney informed the judge of Florissant officials’ unanimous objection to the transportation district. Nevertheless Circuit Judge Brenda Stith Loftin could find no legal reason not to approve the TDD. Moral reasons, yes. But legal, no. To many observers, Wal-Mart and their developer looked pathetic in their desperate craving for a corporate welfare fix. Wal-Mart and Kroenke didn’t seem to care what kind of Three-Letter Subsidy they wrangled (TIF, CID, TDD) as long as they got something from the taxpayers. Anything. Free landscaping. Free signage. Whatever. Still it’s hard to blame Wal-Mart too much. Writing in Forbes, David Brunori notes that it’s wrong to fault corporations for behaving like giant, amoral machines acting in their own self-interest. “They act rationally,” he writes. “If someone gives you $1 billion, you take it. The blame lies with us.” In the end it is the fault of all of us for giving Wal-Mart’s lawyers the tools with which to defeat us. There’s an old saying: You can’t beat City Hall. This is still true for 99 percent of Americans. Just not for the One Percent. Christopher Orlet is a journalist living in Florissant, Missouri. About 13 percent of global wealth of adults is concentrated in the hands of 0.004 percent of the population, according to a new study. And the trend is set to continue with the number of high net worth individuals reached a record 211,275 in 2014. Swiss bank UBS and consulting firm Wealth-X compiled the World Ultra Wealth Report 2014 released Thursday. “Ultra-high net worth” (UHNW) individuals are defined as people with a fortune of about $30 million. Of the 211,275 that fall into the category, 2,325 are billionaires, a 7.1 percent increase since last year. Experts believe the number of billionaires could rise to 4,000 by 2020. “Even amidst geopolitical conflicts, socio-economic strife, and volatile currency markets, the world’s equity markets displayed strong performances, thereby enabling UHNW individuals’ wealth to increase and their influence across industries and sectors to grow — from their importance in wealth management to their consumption of luxury goods,” the report said. The UHNW adult population account for approximately 1 in every 35,000 people in the world, or just 0.004 percent. 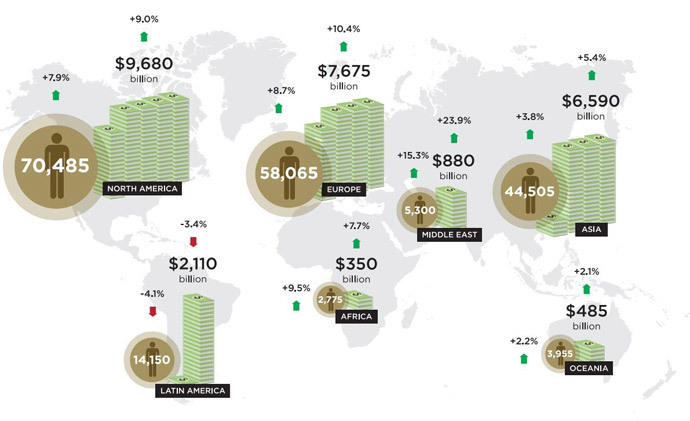 Average wealth of an UHNW individual has risen to $139.4 million, up $1.8 million last year. The geographical heavyweight was again North America, which accounts for nearly a third of the total $30 trillion, at $9.7 trillion in held wealth. Europe is home to about 25 percent and Asia 23 percent. Another major trend the report forecasts is that Asian wealth will overtake Europe in 2017. Currently Asia is home to 44,505 super-wealthy individuals with a combined fortune of $6.6 trillion, and Europe’s wealth stands at $7.7 trillion, shared between 58,065 people. Latin America is the only region in 2014 to incur a fall, down 600 individuals and $75 billion. Eighty-seven percent of the list is men, and more than two-thirds struck it rich on their own, 13 percent by inheritance, and the rest a combination. The average UHNW individual spends $1 million a year on luxury goods and services, the report says.